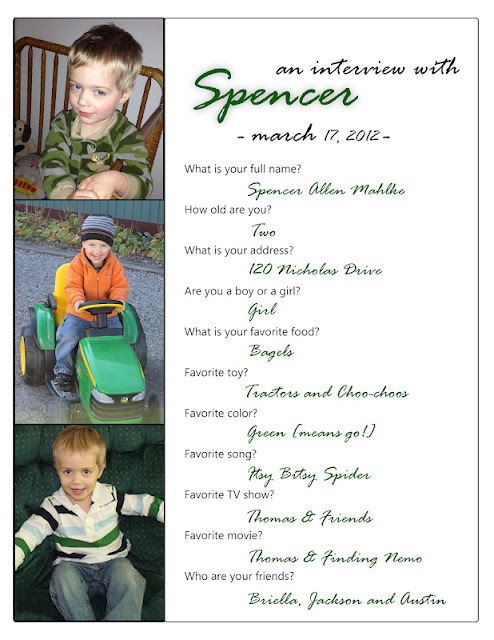 I was reminded of an idea on Pinterest that I originally found in a Parents magazine when Spencer was just a baby. I was waiting to do it until he was able to verbalize the answers for himself. The idea is to interview him on the favorite things in his life, and to continue to do this each year to document the changes in his life. I decided it would be more fun to do it in a video form. Here is the video. I also included the paper version of the interview below it.